Mindaugas lives in Vilnius, Lithuania, and works for Nissan as part of the communications team in the Baltic region. It means the ‘tough and smart’ Nissan Navara was always going to be the vehicle to make his dream come true. 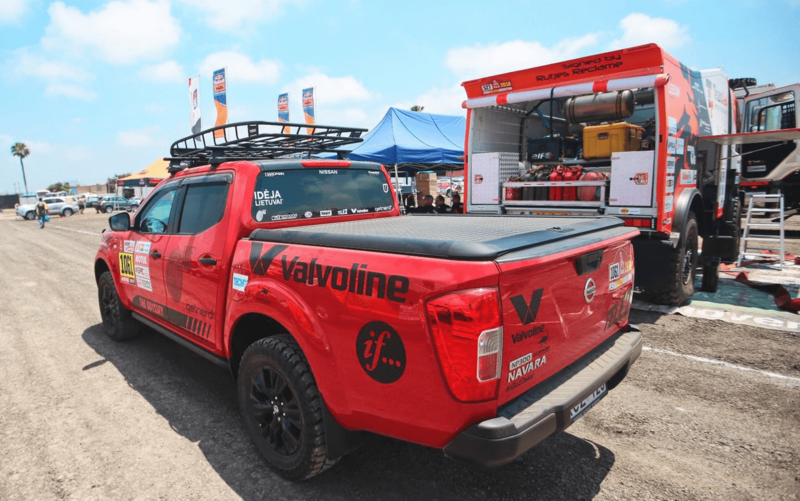 He bought the pickup in September 2017 and ever since has been liaising with aftermarket component suppliers to upgrade the Navara. His goal – to make it ready to tackle the route of what many consider the world’s toughest endurance rally. The vehicle is a Double Cab model, powered by a 2.3-litre 160PS diesel engine linked to a six-speed manual transmission. Finished in Flame Red, the ride height has been raised 4cm with an Old Man Emu suspension system. Nissan side bars and a rear bumper bar have been added to improve styling and durability, while a Rival underbody protection system has also been fitted. Night-time visibility is improved by a Hella LED light bar, while a plastic load liner and aluminium load cover provide secure storage. On the roof are Thule cross bars and roof rack, plus a Lazer Triple R 16 LED bar for additional lighting. The exterior is finished with 18-inch black alloys and Cooper Discoverer ST Maxx tyres. Inside the Navara is standard apart from a 220V power converter plus the addition of four extra USB sockets. Mindaugas added: “The tough and smart character of the Nissan Navara makes it the perfect vehicle for this adventure. Apart from the suspension upgrades and body protection, it’s a standard vehicle. Every other new component is there to make life easier. 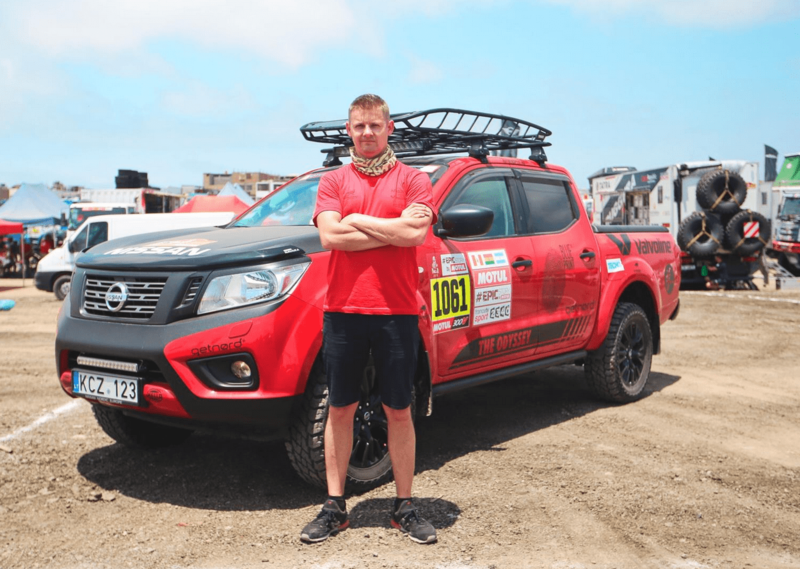 The route through South America will be hard, but I expect the Navara to cope with it.” The Dakar Rally is a hugely popular sporting event with Lithuanian car fans. Competing in the 2018 edition are three drivers, two co-drivers and a motorcyclist – all from a country with less than three million inhabitants. Mindaugas, who is accompanied by photographer Andrius Laucius, will be following the competitors as they leave the Dakar Rally start line on January 6. Two weeks, 14 stages, 9,000km and three countries later, the pair plan to be crossing the finishing line in Cordoba, Argentina. The Navara is built on more than 80 years of Nissan pickup heritage. It was the winner of the prestigious International Pickup Award 2016, and more than 50,000 units have been sold across European markets in the last two years. Like all Nissan LCVs – which include the e-NV200 100% electric zero emissions van – it comes with a class-leading five-year warranty. High levels of refinement, style, comfort and quality come as standard on the Navara. It was developed to extend these characteristics – so closely associated with Nissan’s award-winning Juke, Qashqai and X-Trail crossovers – into the LCV segment for the first time. Pioneering technologies available on the Navara include Nissan’s Intelligent Around View Monitor camera system and Intelligent Emergency Braking. Next articleDon’t Forget Your Toll Tag!